Interview mit Kato Havás für ESTA. The following interview with Kato Havas is an article that I wrote for ESTA Italia. It was published on the first issue of "A Tutto Arco", ESTA Italia magazine. Here below is the English version, here is the Italian version as it appeared on the magazine. I began to study with Kató Havas when I was 17 years old after leaving the prestigious Vienna Academy of Music where I was studying to become a professional violinist. It was at the suggestion of my professor, Thomas Kakuska from the famous Alban Berg Quartet, that I went to study with Kató because I had developed a severe backache. In those days this was an unusual act because the New Approach was still not accepted by the conventional music institutions. I went on studying with Kató for 5 years and what I got musically and in human terms was immense and has stayed with me to this day. I also got the opportunity to be a soloist at her international music festival. After various orchestra jobs I decided to go back to Vienna, dividing my time between a busy performing schedule and teaching and eventually became Kató’s representative teacher there. Italy was the perfect place to start giving courses, courses which could not have taken place without Roberto Moro’s (the Italian KHANA Representative) competent and reliable organisation. I have been giving courses in Padua for some time now. Pupils range from amateur to teacher to high-powered soloist. I am happy to say that with the New Approach system I have been able to help them all alleviate their problems. Anyway, the word spread and the conservatory of Udine, preparing students for the profession, invited me to give a workshop. In my student days in Vienna this would have been unheard of. The “New Approach” in a conservatory!? The Italian cello professor who had also been on one of Kató’s courses was particularly keen on the workings of the New Approach - so much so that (with ESTA) he helped organise my next course in the Conservatory of Vicenza. Times are really changing. Suffering is somehow ‘out’ and finding ease and enjoyment is ‘in’. Although giving a course in such an establishment worried me, it went well. Two professors there had been at Kató’s course some years before, so their pupils knew the basics. We enlarged on that. One professor, first violin of a famous quartet, who had also studied with Sandor Vegh, asked very precise questions, and we were able to discuss ideas in a very constructive way. (On my many musical journeys I had also met Sandor Vegh, who had been a colleague of Kató’s at the Liszt Ferenc Academy, and had studied with the same professors.) They had many ideas in common. The professor in Padua was particularly pleased to hear that the New Approach agreed with Vegh about the bow change through the swing of the elbow and the left hand, so the bow change was inaudible - something you really need in chamber music. After all, “the proof of the pudding lies in the eating”. So goes the English proverb which Kató has often used. But what is this proof of the pudding in violin playing? What is the criterion of a great teacher or a method that works? Most people would say the proof of a great teacher lies in his pupils who are maybe famous soloists and giving that teacher credit. So let’s go back to the beginning of a soloist’s career. First of all, one needs to audition with a good technique. In fact, to be already a finished product, so that all the teacher has to do is give some extra finishing touches, inspiration and hopefully some contacts for performances. Kató says that in her experience those players with the biggest problems turn out to be the most gifted when the problems are alleviated - “like finding pure gold! And these are the ones who fall by the wayside and often stop playing altogether”. She never gives auditions - “ a teacher’s job is to teach everyone who wants to learn”- and has taught all ages and levels of playing from amateurs, high powered players, teachers and beginners. She believes that everybody is gifted in different degrees. The New Approach is not a method, Kató would passionately explain. “The word method implies something fixed and the whole point of the New Approach is that there are no fixed hand positions and no fixed violin and bow hold (sometimes called bow grip)”. For that matter there is no violin hold and no bow hold as such. The violin becomes part of each individual player. The violin and the player become partners in perfect balance and the bow becomes a follow-through of the balanced light, flying right arm, in the service of the inner ear and the from inner outward flow of musical energy. Kató was born in Transylvania in 1920 and started to play the violin at the age of five, giving her first recital at the age of seven, when Emil Telmanyi heard her and was so impressed with her playing that he arranged for her to study with Waldbauer at the Liszt Ferenc Academy in Budapest. “A first recital is always a big event” to quote from her book Stage Fright, “especially if one happens to be seven years old. I clearly remember the pink rococo- style taffeta with the matching bow in my hair and the two things that were dinned into me. The first was that I should look on the audience as if they were so many cabbages and on no account was I to take any notice of them. The second was that I should go on playing no matter what happened. “The cabbage idea I did not understand at all. Why should I turn the audience into cabbages when I could hardly wait to play for them? So the moment I stepped on stage and heard the applause I forgot all thoughts of cabbages, and I remember to this day the face of the woman in the front row. But I followed the second idea and when, due to a short circuit, all the lights went out (the performance took place in Transylvania), I dutifully continued with the fast ‘tee-tee-tuum-tum-um-pa-papapapapa-pum’ bit of the Brahms Hungarian Dances, even though the pianist did not. “By the age of fourteen, however, I knew better, and at my first recital in Budapest (at the Academy of Music) I would have given a pretty penny for the audience to turn into cabbages, especially when at the beginning of the Devil’s Trill I saw Hubay, Kodály, Weiner, Dohnanyi, and Bartók appear, one by one, on the balcony level with the stage. They had come to find out what the girl from Transylvania sounded like. Hubay with his long white hair and white beard not only resisted all ideas of turning into a cabbage, but looked like a dignitary from Heaven itself, ready to dole out the most terrifying punishment. So all I could do was lose awareness, and all I remember is coming to only at the sound of applause at the end”. Waldbauer was a remarkable man and a superb musician. He was the leader of a prestigious quartet. He was also a revolutionary at the Academy with his teaching with ideas of the “Gestalt”. He was a very good friend of Bartók and Bartók dedicated some of his quartets to him. Kató tells the story of how Ivan, Waldbauer’s son, the same age as her, about ten or eleven, both sat listening to a rehearsal with Bartók present. Ivan became restless and they were both thrown out of the room in disgrace. Kató remembers how, in order to restore their lost dignity, they went upstairs to smoke cigars. She saw Ivan’s face turn beetroot, then she turned to the door and there were Waldbauer and Bartók standing quietly watching them. They were made to smoke the cigars to the end. Shortly after receiving her diploma at the Academy at the age of 19, Kató Havas gave her debut at Carnegie Hall in New York followed by a country-wide tour which was a very stressful time for her and she began to develop aches and pains and with that the inevitable stage fright. During that time war broke out and Hungary declared war against America so that she became an enemy alien and couldn’t return to Hungary. As it happened, she got married and gave up her concert career for eighteen years to bring up her children. It was during this period that she began to formulate the New Approach to Violin Playing. She remembered the ease and joy her gypsy friend Csicso had evoked with his playing, and what enormous pleasure he had given as a result. “He lived in a village by the Danube about thirty miles from Budapest, where I used to spend my summer holidays. And even now I can count on the fingers of one hand the people I have heard play who can equal the quality of his tone with its warmth, its flexibility and its endless subtle variety. It was the nearest thing to the human voice I have ever heard, and the pleasure he took in playing was a feat to watch by itself. I can still see his smile with his white teeth showing, his eyes lighting up as he acknowledged an order for a favourite song. There was, and I sincerely hope still is, a custom in Hungary which is called “Mulatni”. This word so far as I know is untranslatable, but describes a peculiarity unique to the country, practised mostly in the villages. It is a sort of “letting off steam” process. If a peasant is visited by a great sorrow or a great joy, or sometimes both at once, it becomes necessary for him to express his music in front of and with the help of as many people as possible. So he goes to the inn, which is also a restaurant, or a restaurant which is also an inn, and spends hours, sometimes days, ordering songs from the gypsies to suit his mood. He sits at a table with a jug of wine in front of him and listens to them in a broody silence, or, singing to their playing. He waves everybody to join in as well, while making sure that somebody has seen to the distribution of wine. “As often as not, these occasions ended in a fight, so I was usually kept away. But the restaurant Csicso played in was close to the Danube very close to our house, and I have seen enough to be amazed at his complete identification with any given song and his ability to cast a spell of sorrow or joy over us all. In fact, without knowing it then, I witnessed the epitome of perfect artistic communication. “Csicso and I were friends. His letters when I was in America, and even after I was married, always began “Draga Katokam”, the equivalent of “Dear little Kato”. Then after a while, the letters (which he always dictated because he himself could not write) stopped. I heard later that he had died shortly after the war; and that at his funeral his violin, with all the strings cut, was carried on a red velvet cushion, and was lowered into the grave and was buried along with him. Kató has a lasting effect on her pupils. To quote from the January 2008 issue of KHANA (Kato Havas Association for the New Approach) The New Approach and Me - From Teen to Teacher by Jeanne Porcino Dolamore, ‘I was born the sixth of seven children into a house filled with music. I began to play the violin at four, and remember early ‘before school’ lessons from my father and all seven of us performing for grandma and others, on the stairwell, in the living room or anywhere that required the spirit of music. ‘Many years, and many violin lessons and concerts later, I met Kató Havas for the first time as a young teenager, on a visit to New York City with my father. My father, Chet Porcino, already well established in his career as a string teacher, was experiencing an exciting transformation in his teaching as he began to incorporate the ideas of the New Approach into his work as a public school string teacher and into my violin playing as well! ‘At the time, I wasn’t sure exactly what was going on, but I could hear the excitement in my father’s voice, and I could sense the shift in the words and images he used and the ideas he tried to get across to me during our lessons. In high school, I began to study privately with Howard Cook, who himself was also working with Kató and merging her ideas into each of my lessons. 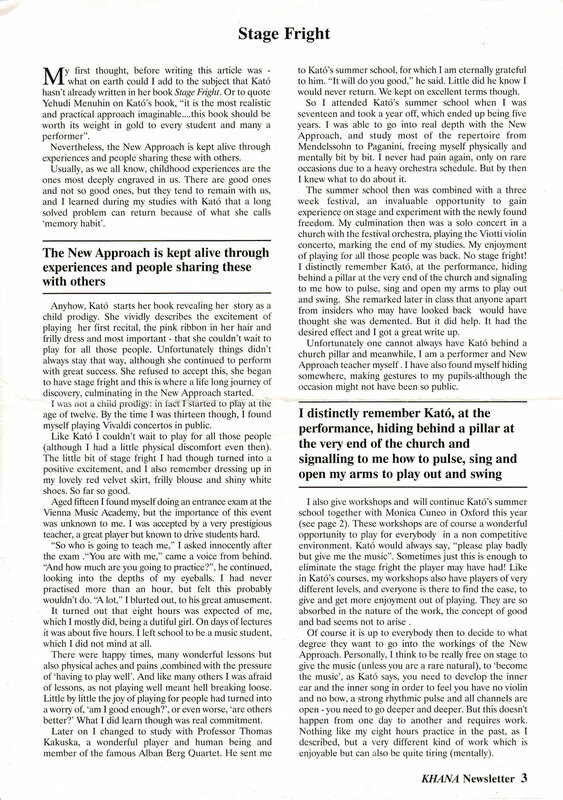 ‘The New Approach was having a powerful and life changing impact on the adults at the center of my musical upbringing - and so it was in this manner that the New Approach came to quite simply, be a part of who I am - a part of all of the violin playing and teaching I have been doing ever since I walked into Kató’s ‘arms wide open’ embrace for the first time and experienced the joys that accompany her teaching. Kató always gives two-hour lessons when one brings a new piece to her. The first thing she asks a pupil, when he or she is anxiously anticipating starting to play, is that they put the violin and bow back in the case. And then one is asked: “What do you know about the composer? And I don’t want to hear how many works he produced. I want to know about him as a person. What is his country? What is his era? Do you know his historical background?” And, finally, “What do you see visually?” That is often more difficult for people than one imagines. How on earth can you see music visually? Then, on top of it, one is required to sing it, “...and please don’t sing beautifully. What I want to hear from your voice is what you hear with your inner ear.” Then she embarks on the role of imagination in music-making. One is made aware of the drama of the intervals. And that is one of the main points of the New Approach - the realization that music really is in the left hand in between the finger spaces. Then she demonstrates the difference between what she calls a ‘jolly whole step’ and a ‘tragic half step’, both ways, but especially in the descending interval. She says “the bow couldn’t do this in a thousand years.” Then one has to sing and mime the intervals with an elastic, soft left hand. At this stage the pupil has still not actually started to play, but he or she is made aware of the enormous optical illusion which besets violin players - that the black fingerboard stretches away for miles (just to give one example). Somebody said it looks like a motorway which, when you measure it sideways, or measure an octave with a piece of string, is reduced to a ridiculously small size (see The Kató Havas Teaching DVD). Then come the exercises of no violin and bow hold - the weightless arms. Instead, the complicated bowing technique is reduced to what Kató calls two hinges, the ‘swinging’ shoulder and elbow joints. The whole purpose of these exercises is absolute physical and mental coordination, so that the player can experience inside outward musical energy. To quote excerpts from Don Peterson in ASTA: ‘Kató does not remember anyone who was addressing the areas of physical stress and mental anxiety in string playing in America. With the plethora of articles and books on the subject available today by others, it seems that the message is growing…..
‘She also states, “The New Approach is not an easy option, and it requires very deep focus and constant awareness”. When working the New Approach concepts, you experience a new level of freedom to play every time you pick up the instrument. ‘Having received the Ysaye Award many years ago and the ASTA Isaac Stern International Award in 1992, Kató was recently honoured with the Order of the British Empire Award, which was presented to her at Buckingham Palace by Prince Charles. Conducted with royal ceremonial pomp, a remarkable video of the investiture shows the entire event. Presented to individuals who have given meritorious service to society and to England, the award seems to summarize what the Havas New Approach is all about. As Kató states, “What the New Approach is really about is people and their welfare as players”. Though Kató’s yearly workshops in California and Vermont continued until the year 2000, she has curtailed her worldwide travel now that she is in her 80s. In her Oxford studio, the work goes on with players coming from many countries. These players hear about the New Approach from the Havas books which have been translated into many languages, and International organization called Kató Havas Association for the New Approach (KHANA) with representatives in 23 countries, a teaching video, former students who teach the New Approach and her ongoing teaching in Oxford. As we sat down for Sunday tea, Kato stated that she enjoyed thinking back about things that had been lost “in the fog of time”. 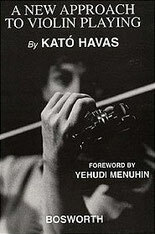 ‘Kató couldn’t remember the first workshop that she taught in America, but the first workshop in England occurred after the publication of her initial book, the New Approach to Violin Playing. This evolved into the Kató Havas Summer School in Dorset, England. Players from the United States (US) came out of curiosity. Ivylyn Traver, a string teacher at Pacific Union College in Angwin, California attended; on her return to California she started the California workshop that continued for 28 years. During that time people asked for workshops at universities and institutions all across the US. Kató estimates that probably 80 or more events occurred covering the US from coast to coast. “It was really quite amazing; I never had an agent!” Also, the news spread internationally, and workshops were held in Austria, New Zealand, Switzerland, Prague, Budapest, France, Ireland, Holland, Italy and other countries. Some players who have studied with Kató have taken the New Approach to South Africa, Argentina, Australia and New Zealand. ‘Kató states that, “in the U.S. it was much easier to gain acceptance than in the early years in England before the books were published. The whole thing was an accident! While living in a cottage in Dorset, a fellow came by looking for horses for his children to ride. I was just giving a lesson to a friend who needed help. He turned out to be a music advisor, and he was so interested in what I was doing that he wrote an article for the Strad magazine. Then all hell broke loose! Letters came in to the Strad - ‘this is nonsense’. I felt like I was a Picasso painting with my head under my arm! Arguments went on for two or three years, and I never answered the letters. I just kept on teaching with results and fun”. ‘As a result of this activity, Bosworth and Company wrote to her with a proposal to publish the first book, A New Approach to Violin Playing. They arranged a lecture and demonstration on the date of publication. Although only expecting 60 people to come, the audience turned out to be 600! All of this caused a flood of articles in teaching journals, and radio and TV interviews; it also provided the impetus to start the summer school and music festival in Dorset. “Players came from South America to Shanghai and Italy to Iceland”, she said. ‘Kató’s studio is in the beautiful, Summertown area of Oxford. During my visit, it was full of flowers and mementos that grateful players had sent from all over the world. It is truly an international centre in the heart of Oxford’. 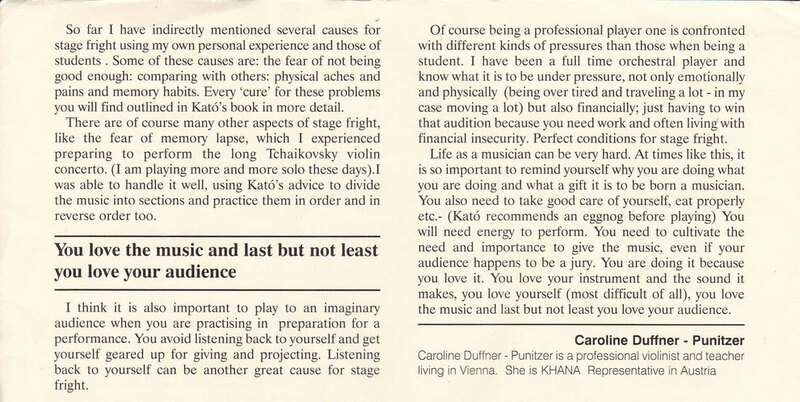 Finally, I would like to end this article with a quote from Kató’s Stage Fright: ‘it is important to realize that our responsibility as musicians lies in the lifting up emotionally and aesthetically of all our listeners, regardless of whether they are examiners, auditioners, or members of an audience. If all our energies are channelled into giving people, through the medium of music, a deeper understanding of their own potential as part of the wonderful mysteries that the universe contains, we would not only do justice to ourselves as musicians, but stage fright would be banished from the face of this earth forever”. I began to study with Kató Havas when I was 17 years old after leaving the prestigious Vienna Academy of Music where I was studying to become a professional violinist. It was at the suggestion of my professor, Thomas Kakuska from the famous Alban Berg Quartet, that I went to study with Kató because I had developed a severe backache. In those days this was an unusual act because the New Approach was still not accepted by the conventional music institutions. I went on studying with Kató for 5 years and what I got musically and in human terms was immense and has stayed with me to this day. I also got the opportunity to be a soloist at her international music festival. After various orchestra jobs I decided to go back to Vienna, dividing my time between a busy performing schedule and teaching and eventually became Kató’s representative teacher there. Italy was the perfect place to start giving courses, courses which could not have taken place without Roberto Moro’s (the Italian KHANA Representative) competent and reliable organisation. I have been giving courses in Padua for some time now. Pupils range from amateur to teacher to high-powered soloist. I am happy to say that with the New Approach system I have been able to help them all alleviate their problems. Anyway, the word spread and the conservatory of Udine, preparing students for the profession, invited me to give a workshop. In my student days in Vienna this would have been unheard of. The “New Approach” in a conservatory!? After all, “the proof of the pudding lies in the eating”. So goes the English proverb which Kató has often used. But what is this proof of the pudding in violin playing? What is the criterion of a great teacher or a method that works? Most people would say the proof of a great teacher lies in his pupils who are maybe famous soloists and giving that teacher credit. So let’s go back to the beginning of a soloist’s career. First of all, one needs to audition with a good technique. In fact, to be already a finished product, so that all the teacher has to do is give some extra finishing touches, inspiration and hopefully some contacts for performances. Kató says that in her experience those players with the biggest problems turn out to be the most gifted when the problems are alleviated - “like finding pure gold! And these are the ones who fall by the wayside and often stop playing altogether”. She never gives auditions - “ a teacher’s job is to teach everyone who wants to learn”- and has taught all ages and levels of playing from amateurs, high powered players, teachers and beginners. She believes that everybody is gifted in different degrees. The New Approach is not a method, Kató would passionately explain. “The word method implies something fixed and the whole point of the New Approach is that there are no fixed hand positions and no fixed violin and bow hold (sometimes called bow grip)”. For that matter there is no violin hold and no bow hold as such. The violin becomes part of each individual player. The violin and the player become partners in perfect balance and the bow becomes a follow-through of the balanced light, flying right arm, in the service of the inner ear and the from inner outward flow of musical energy. These are books written by Kato Havas OBE, the teacher whom I studied with for many years. I would warmly recommend them to you! 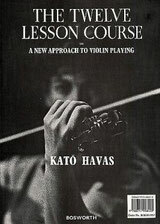 Kato Havas books are about the “New Approach” which is a new method of violin playing. It is “new” as it does not follow conventional methods of violin playing. Rather than focusing on which way to place your hands and even forcing your body into the “correct position”, it focusses on what we call the fundamental balances. This may sound complicated, but it is not as it involves applying natural body motions, movements we do in daily life without even thinking about it. The perfect answer to tension, cramp and musical frustration that unfortunately so often come along with violin playing. Many points can also be applied to other instruments. Enjoy reading! The Twelve Lesson Course (A New Approach to Violin Playing). For Violin. 88 pages. Bosworth & Co.
A New Approach to Violin Playing For Violin. Classical. 79 pages. Bosworth & Co.
Of all Kato Havas books on violin playing, I consider the book Stage fright the "bible for violinists", addressing problems and fears that players of all levels often experience and offering concrete practical solutions. It was first published in 1973. 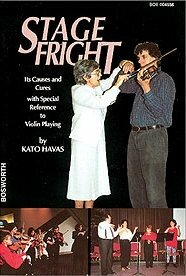 Stage Fright (Its Causes and Cures with Special Reference to Violin Playing). For Violin. 136 pages. Bosworth & Co.
"The players in the photographs Caroline Duffner, Sara Edgerton, Gale Hess, Karen Normandia, Paul Orton, John Sommerfield and Richard Thomson. They are all exponents of the NEW APPROACH both in their playing and their teaching. I am grateful to them for giving their time so generously and with such enthusiasm. Last but not least my deepest appreciation goes to Dr. Landmann for helping me channel the New Approach into the classroom..."